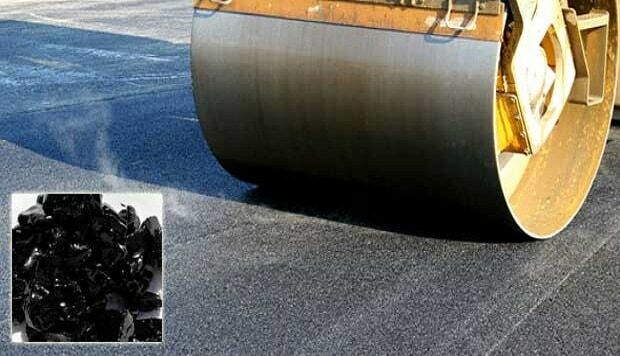 Bitumen is the binding material present in asphalt. Sometimes it is also known as mineral tar. Bitumen is produced by partial distillation of crude petroleum. it is chemically a hydrocarbon and insoluble in water. But it totally dissolves in alkalies, alkaline carbonates, benzol, chloroform, bisulphide, naptha, coal tar, petroleum spirit and oil of turpentine. It is obtained from 87% carbon, 11% hydrogen and 2% oxygen (By weight). The bitumen is produced in solid or semi-solid state and black or brown in color. It is a liquid compound which contains a large amount of bitumen in aqueous medium. It is suspended by some appropriate stabilizing agents in the aqueous medium. This form of bitumen is produced by fluxing asphaltic bitumen in presence of some liquid distillates of petroleum or coal tar. Cut-back bitumen can be used as bitumen paint in cold. It is a special form of bitumen produced by passing air under pressure at a higher temperature. This type of bitumen can be used as heat insulating material, roofing and damp-proofing felts, producing asphalt pipe and joint fillers etc. It comprises of bitumen thinner and appropriate inert filler (40%-45%). Plastic bitumen can be used for filling cracks in masonry structures, stopping leakages etc. Hydraulics & erosion control Catchment areas, basins.